Only just got this up and running, still a WIP will post more info soon. Waiting for more stable patches/drivers before proceeding here. 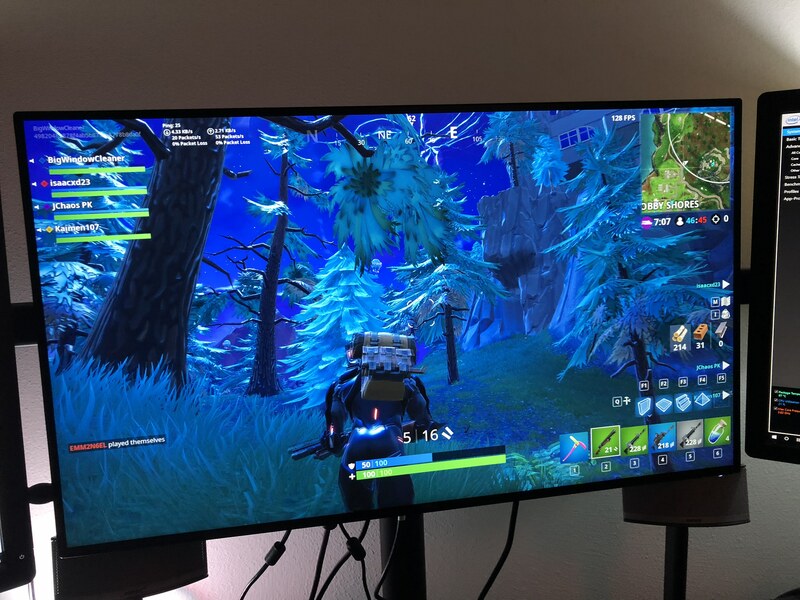 Fortnite was more or less unplayable due to random drops in FPS which I assume was due to CPU throttling. More investigation needed. do you still hot plug this? Was your Windows eGPU setup really that straightforward? I have the 2018 i7 MBP and the same enclosure, yet I can't get Windows to recognize anything other than a charge. This has been incredibly frustrating, and 0xbb's cpu-switch causes flickering rows of pixels when attempting to use integrated.bat, so I'm out of ideas. I had also some random drops of FPS due to thermal throttling. I went into power settings on windows and reduced processor speed to 99% which solved the problem. with my Macbook i9 2,9 the frequency is now locked down to 2,9 which is working without any throttling. FPS is now good and stable. 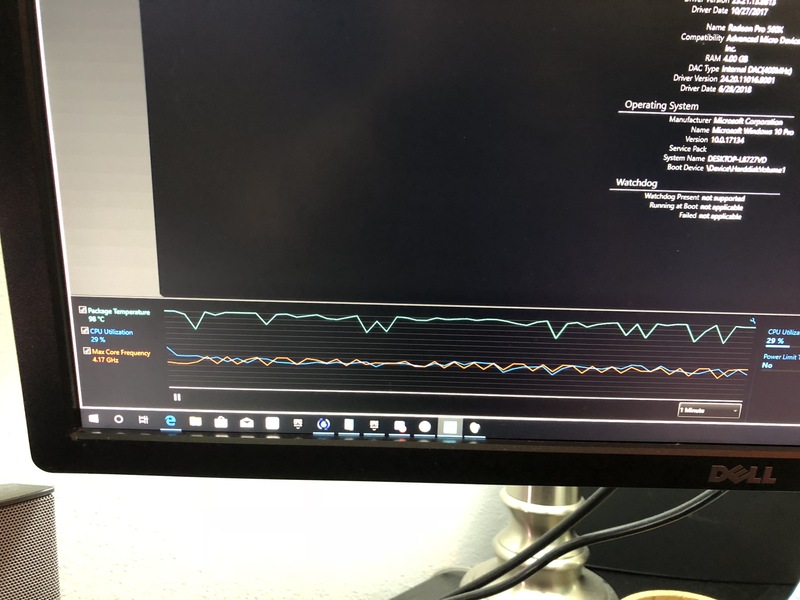 When setting back to 100% throttling is back and frequency goes up to 4 and above and then throttling down to 800 (idle) now and then which leads to stuttering. @citylight7777 , when you set CPU to max 99% it disables the turbo multipliers & so drops performance. Instead, consider using Throttlestop software to decrease the max multiplier until your game/app is throttle-free. It will certainly be higher than the x29 multiplier you are being limited to now. @nando4: thanks, that's a good hint. I will try that! according to the notebookcheck.com article (German, idk if an English version exists) it's ways more effective to set a power limit of 45W. The article says a software called Intel XTU is capable to do that. To make use of the boost you can specify that the 45W limit kicks in after X seconds of high CPU usage. They said 28 seconds is normal. This speeds up the CPU by about 20%. For 13 inch MBPs of 2018 they suggest so set the limit to 31W. The problem is that apple just caps the CPU by temperature. This causes the extreme performance drops because the processor fires up to nearly maximum power but in the next moment it's too hot and throttled to 800 MHz. Then it's cool enough again and it boosts again and so on and so on. The cooling system is capable of cooling the CPU when it runs with it's TDP (or in case of the 13-inch MBP even a bit over the TDP) but the boost kills it. So setting a power consumption limit (or undervolting) seems to be the best solution here. Glad to see that lowering the voltage has become an effective solution to stop the throttling. @nanoBit Haha for sure. My friend was telling me he was having the same problem with his Windows Laptop he recently purchased. Surprise — It has also has the 8th Gen Intel CPU. From what he's told me, the Intel Chip gets wayyy to hot for the Laptop to handle (just like the 2018 MacBooks). As you can guess, lowering the voltage made his problems go away as well. Edit: He has the Gigabyte Aero 15X. Thermal throtting has become an issue with those Laptops as well. Here is a YouTube Demonstration of how undervolting can improve performance with that particular laptop. Yes - after seeing this post I immediately went into Boot Camp and plugged the Core X with a 980 Ti into the bottom right Thunderbolt 3 port (so on the right side of the computer, there's the Headphone jack, a free TB3 port, and then the port I plugged it into) and Windows installed the Nvidia drivers immediately. I then went and installed the Geforce Experience program to get the latest drivers and am currently installing a few games in Steam to do some tests for. While gaming, at what frequency does your CPU stay? Installing the macOS High Sierra 10.13.6 Supplemental Update for MacBook Pro (2018), will post any updates as they come. @robertjfclarke Look forward to your results. 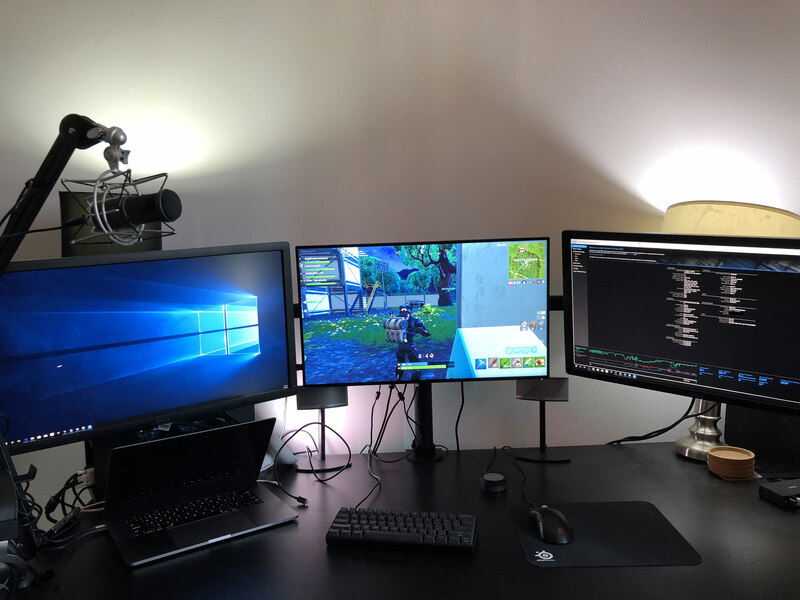 If anyone has any suggestions for a good cooling dock for the laptop please let me know, would be interested in testing Fortnite + 1080TI + Windows with a proper cooling setup. This CPU definitely has the capability to run this game smoothly at 120FPS without the jitters I'm currently experiencing. Can you run a a short Cinebench loop with Intel Power Gadget opened? I'd be very interested if the update really solved the issues. Looks like they have fix the throttling issue but I can't use my eGPU anymore as my Nvidia program say my version is not compatible. I got it working I just uninstalled and reinstalled the drivers and works fine again. I'm glad they have implemented this fix systems seems to be working a lot better will post benchmarks later on. As you guys might have seen by now it appears the update has fixed the issues ( ). Anyone know if there is a decent cooling solution that will help handle the i9? Man, apply lliquid metal to this i9 and you see what performance looks like. Ain't kidding, I'm doing it on mine. You do gotta reapply every year, and make sure you're doing it right, but it can reduce heating by around 20%. I have the intel chip being recognized by using the USB stick at boot. The problem is is when I try to boot into windows with the USB stick after either using the Intel driver from their page or the ones that came with Bootcamp installed, the internal screen will start strobing with white dots and eventually go black. I have have tried to install and use rEFInd without luck as well. So, I have been sticking with the latest Apple-set file renamed to bootx64.efi on the USB stick formatted to Fat/MBR and the appropriate file structure. Im using a Core V2 and 1080ti FE. Have you had any luck with the internal display? Robertfjclarke: please update on your performance with the i9+1080ti in boot camp gaming. I also have the i9. I am super happy to have found this thread! I have an almost identical setup with except my 2018 15 MacBook has 16 gb or ram instead of 32. I am also using Razer Core X with an Aorus GeForce GTX 1080 Ti. I am on 10.13.6 and Windows 10 via bootcamp. Like I said, super happy to see this thread. I just have a few questions because I can't seem to get mine working. What apple drivers were you referring to when you did the install? Where can I find them? Should I install the driver to the Graphics card that came with it on the disk? Are there any other threads anyone here recommends me going to? I have been to quite a few but most I come across are < 10.13.4. I recently got all my gear so I have a month or so to return things incase this all falls apart. I have the same issue as Maven with my 2018 MBP 15”. For the love of god can’t get this internal lcd thing going. I apply integrated.bat and when I reboot using rEFInd I just get the white dots and then the black screen. Did anyone figure this out? But this way there is no optimus so no point to connect an eGPU for internal display acceleration. Thanks for posting your setup! I have a couple questions -- What resolution is your screen? Also, how do you think the i7, 16Gb version of your laptop would handle your eGPU setup in terms of bottlenecks/heat issues? I have the same issue with gigabyte 580rx tb3 egpu. They have a firmware patch on their site that is suppossed to fix it, but my power supply fans still run. I usually just unplug it since I have to hot plug the egpu anyway during windows boot.